. I use my George Forman which makes perfectly grills it. When time is lacking I purchase the already made loaves at Costco which I can slice and grill or cut out in shapes for added fun. Drizzled in an apple-ginger syrup, the juicy strawberries and blueberries add a flavorful flair to this star-shaped pound cake. Topped with a scoop of vanilla or ginger ice cream, one slice of this Independence Day delight and you're sure to see fireworks. COMBINE Juicy Juice, ginger and sugar in glass 2-cup measuring cup. Microwave on HIGH (100%) power for 2 minutes or until bubbly. Allow ginger to steep for 10 minutes. Remove ginger and refrigerate syrup for 1 hour or until ready to use. At Fantastic Sams® Hair Salons, the real question should probably be: What don’t they do? Their goal is to make each customer look and feel fantastic. They offer lots of services, like haircuts and styles, up-dos, straightening, coloring, highlights, and texturizing. They also offer beard and mustache trims, facial waxing, as well as rejuvenating hair treatments for stressed or damaged hair. 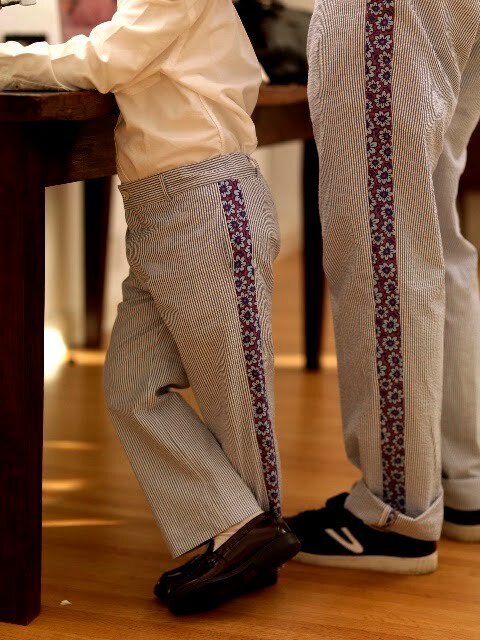 Their stylists are professionals who are always up-to-date on the latest styles and trends. So I guess you could say that keeps them on the cutting edge! And so you can get that fresh-from-the-salon look every day, Fantastic Sams also offers their own line of salon products. Their exclusive brand includes shampoos, conditioners, and styling aids that are specially formulated with their own FantasticComplexTM, which strengthens, smoothes, and adds shine to hair. Best of all, their line offers you salon products at a fraction of what products at other salons cost. Whether it’s with our salon services or our line of products, Fantastic Sams gets you looking good, and feeling good about how affordable they are! Be sure to LIKE Fantastic Sams on their Facebook fan page. WIN: 24/7 MOMS and Fantastic Sams are giving away a $25.00 gift card along with their Moisturizing Shampoo, their Moisturizing Conditioner and their Shine Serum. US entries only and one entry per person. Winner will be chosen on July 11, 2010. *We received complimentary Fantastic Sams Products for review no financial compensation was received. Day 30 - Remember when you were little and you would look into the sky and imagine the clouds were different animal or scenes? Grab a blanket place it out on your lawn and lay down with your kids and imagine what the clouds could be. Q:What is more important to be rich or kind? 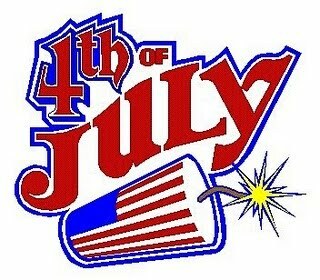 When it comes to a super simple 4th the first thing to think about is what to wear! You have to be festive and fun, while you show off your patriotic colors! 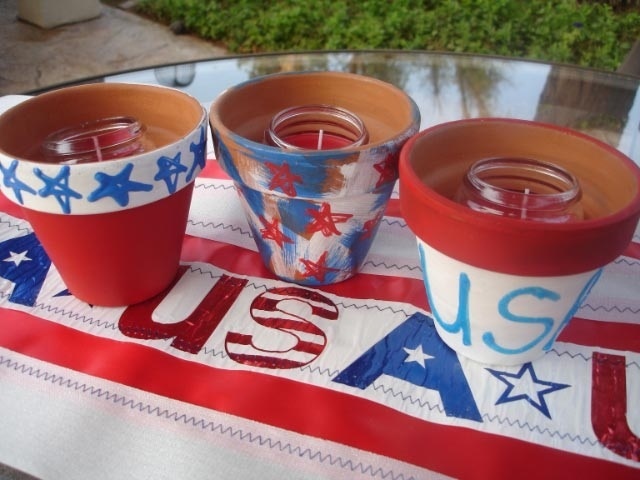 For your table grab a few terra cotta pots and paint them red, white and blue. Make each one different. Place a citronella candle in each one and set them in the center of your table. They are festive and keep the bugs away. To carry all of your tableware and whatever else you need to take to the party get a cardboard wine carrier from the wine store, paint it, embellish it and use it as a carryall to your July 4th event. Terri O is a home arts expert and creator of Super Simple Living. Confetti Launcher: Fireworks happen only after dark, but this craft creates a pop of color any time of day. Kids pull back on the string to release a shower of tissue paper confetti, then gather it up and refill the launcher again…and again…and again. Click here for directions to make your own. Hand-some Tee: With a design fashioned entirely from palm-and-finger prints, this tee will be the talk of eagle-eyed revelers. Click here for directions to create your own Tee. Wig and Tutu in One: Powdered wigs are so 1776. Celebrate the Fourth in 2010 sporting a crazy red, white, and blue pompadour. Or, if you prefer, wear the tulle creation as a tutu. Click here for complete directions. Spirited Bike Spinner: Old Glory won’t be the only thing blowing in the breeze this Fourth. Made from a strategically snipped and bent plastic bottle wrapped in tape, this colorful bike accessory twirls in the air as your kids pedal. Click here to create your Bike Spinners. 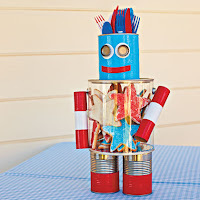 A Patri-botic Centerpiece: Do U need a GR8 helper 4 yours picnic on the 4th? Well, this is one can-do robot. 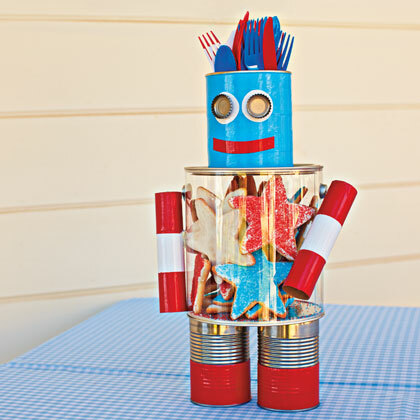 His recycled-can head holds a hair-raising array of utensils, and a clear container belly keeps cookies safe from eager little hands until it’s time for dessert. Click here for directions. A Star-spangled Welcome: This bunting-inspired paper wreath will look as snappy as a salute on your front door. Click here for the How to create your own. My Little Suitcase is a kids travel application created by My Busy Kit for children 2 to 6 years of age. In My Little Suitcase children can pack for their family vacation and choose where to go! Developed by parents, their intention for the app is to encourage free choice and independent thinking so children can participate in trip planning process. My Little Suitcase begins with a bright menu of choices for a beach trip, snow trip, camp trip, or sleepover. Once the destination is chosen, kids get to pack things like mittens, camping lanterns and beach balls. One by one, they choose items to drag into the suitcase until packing is complete. Once they arrive, they get to do what kids to best – PLAY! Kites, beach balls, snowflakes and shooting stars are all part of the My Little Suitcase adventure. More information can be found on the My Busy Kit website. Click here to down load My Little Suitcase App from iTunes. They are ‘peel and post’ messages that adhere with static cling to clean, shiny surfaces. 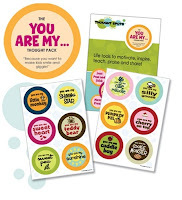 Because they are mess-free, removable and re-usable, it‟s simple and easy to surprise someone with a message, create smiles, teach kids and even, support your own personal goals. WHERE CAN I USE THOUGHT SPOTS™? 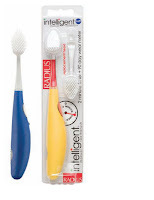 Place them on bathroom mirrors, fridges, windows, whiteboards, aluminum water bottles or any other clean, shiny surfaces and watch them get noticed! 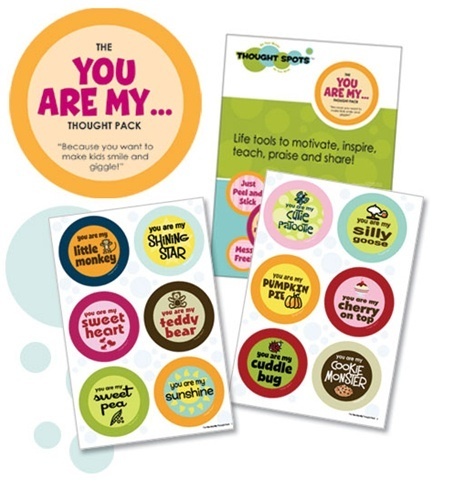 Thought Spots™ help keep important messages in sight and in mind - the kind of messages that will make you and others feel good! They can be put up in unexpected places so they get noticed! Use them to motivate, inspire, teach, praise and share! HOW ARE THOUGHT SPOTS™ ORGANIZED? format called a Big Thought™. These are messages with big impact! They‟re a great alternative to traditional greeting cards because you can share a thought and have it last! There are 15 Big Thoughts™ available. HOW LONG WILL MY THOUGHT SPOTS™ LAST? With a little care and safe handling your Thought Spots™ will last several years or more! Store them flat in the packaging envelope when not in use. If dirt and oil residue from surfaces/hands cause them to lose their cling, simply use a washcloth and water to gently wipe clean the back of your Thought Spot™ and it‟ll be clingy again! Enjoy posting and changing your messages regularly. WHAT ARE SOME OF THE BEST WAYS TO SHARE A THOUGHT? Share a message in a school lunch box – post it on their waterbottle! Surprise a family member first thing in the morning with a special message on their bathroom mirror – great for working parents who leave the house early! Post a message on the fridge for the whole family to enjoy! Share a Big Thought with a friend to brighten their day. Give a Pack as a present with your favourite gift card attached – perfect for teachers gifts, wedding showers, baby showers, kids birthdays, and other “thoughtful” occasions! 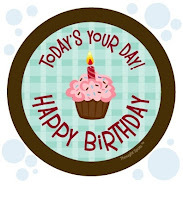 SHOP: Enter coupon code 247moms at checkout and you’ll get a Free Happy Birthday Big Thought with any order. US entries only and one entry per person. Winner will be chosen on July 11th, 2010. *We received a complimentary Thought Spots for review no financial compensation was received. Originally $200, LuggageGuy.com has dropped the price of the Diane von Furstenberg Luggage Signature VI Fashion Tote to only $39.99. To make the deal even better use coupon code GUY28 to get another 28% off and lower your price to just $28.76 + Free Shipping & No Sales Tax! This tote is a patterned jacquard of densely woven of cotton and polyester. The coupon expires on 7/1/10. For more LuggageGuy Coupons and Deals check out Coupons.247Moms. Dont' forget to join us tonight for the #1 Mom Webcast designed by MOMS for MOMS right on your own computer! Day 29 - Grab your bucket of chalk and head outside with your kids for a fun game of hopscotch. Chalk it on your driveway or sidewalk. Be sure to give your kids hopscotch markers like you used as a child, I used a chain I wore. Q: How would you describe or explain God to someone? Q: What did the sea say to the sand? No cable required - You can tune in each Tuesday night and watch 24/7 MOMS Live in the comfort of your own chair, in your own home at your own computer. Put your kids to bed - Surf over to channel www.247moms.com on your computer and join us. Tweet, TXT, Facebook , invite all of your MOM friends to this weeks 24/7 MOMS Live Webcast. Create one of these YUMMY desserts for your upcoming 4th of July celebrations. PREHEAT oven to 350° F. Place liners in muffin cups. PREPARE brownie mix batter according to box directions; stir in Dark Chocolate Cherry Raisinets after all ingredients are combined. Fill prepared muffin cups 1/2 full with batter. BAKE for 15 to 18 minutes or until wooden pick inserted in center comes out slightly sticky. Cool completely in pan on wire rack. Top each brownie with 1 scoop (about ¼ cup) Yogurt Blends. Cook’s Tip: For healthier brownies, substitute equal amount of LIBBY’S 100% Pure Pumpkin for oil in brownie mix. * For a more intensely flavored brownie, substitute merlot wine for water called for in brownie mix. PREPARE brownie mix batter according to box directions; stir in 1 package Dark Chocolate Cherry Raisinets after all ingredients are combined. Fill prepared muffin cups 1/2 full with batter. BAKE for 15 to 18 minutes or until wooden pick inserted in center comes out slightly sticky. Cool completely in pan on wire rack. CUT brownies in half. Place one brownie half in each of 24 parfait cups. Spoon 2 tablespoons whipped topping over each brownie half. Spoon 2 tablespoons pudding over whipped topping; top with remaining brownie half. Top with 1 tablespoon whipped topping. Sprinkle parfaits with remaining package of Dark Chocolate Cherry Raisinets. BAKE for 15 to 18 minutes or until wooden pick inserted in center comes out slightly sticky. Cool completely in pan on wire rack. Dust with powdered sugar. WIN: 24/7 MOMS and Nestle are giving away 5 packages of Cherry NESTLÉ RAISINETS Dark Chocolate-Covered Dried Cherriesto one mom. *We received complimentary Cherry NESTLÉ RAISINETS for review no financial compensation was received. The coupon expires on 6/29/10. Shipping is a flat $7 and sales tax is charged in most states. For more Old Navy Coupons and Deals check out Coupons.247Moms. P.S. Let us know what deals you find using this coupon! Day 28 - Allow your children to choose a recipe to cook or bake from yours or their favorite cookbook. You can also search online for kid friendly recipes and enjoy cooking together. Q:Is it OK to call someone names? Why or why not? Q: What did the sock say to the foot? Day 27 -Take your children fishing. Q:What is your favorite movie? Why? Q: What did the belt get arrested for? Host an art fair for the neighborhood kids. Set out paints, markers, and big sheets of paper on picnic tables and let budding artists show their stuff. Display the works along a fence and hand out awards for everything from the most colorful to the most surprising art. For younger kids, dedicate an area outside for chalk art. Supply the colored chalk and let the kids take the lead on their creative designs. For more ways to celebrate 4th of July from Nestle click here. Summer is traditionally a time for kids to run and play outside in the sunshine. Sometimes, however, kids decide they’re bored and have nothing to do. 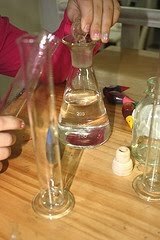 In order to avoid this with my own kids, I came up with my top 5 science experiments that are disguised as summer fun, with no need for special teaching supplies. If you want your kids to keep track of the different science experiments that you do together, there are a few simple elements to write down on a sheet of paper. · Question: What question do you have that you want to test? · Hypothesis: This is your “best guess” about you think will happen, or how you think your question would be answered. · Procedure: What are the steps to completing the experiment? · Observations: Sentences and sketches that describe what happens during the experiment. · Result: What is the outcome of the experiment? · Conclusion: How was your question answered? Was your hypothesis right? An alternative to writing everything down is to discuss each element with your kids while completing the experiments. This particular science experiment’s results will take a few days to actually see. The fun part is that you can turn it into a necklace for your children to wear while you’re waiting. Question: What will happen to a bean or seed when soaked with a cotton ball for three days? The procedure is simple. Wet one cotton ball with water and put it into a small, snack-size Ziploc bag with a bean or seed. For a fun necklace, make sure the bag is sealed, punch a hole in the top, string a length of yarn through the hole and tie a knot. Check on the seed or bean each day to keep track of what’s happening. This is a great experiment for opening a discussion about food choices with your kids. Question: What will happen to a paper bag when a Bugle is placed inside? For this experiment, place a Bugle in a small, lunch-sized paper bag and fold the top down. Watch the progress each day as the grease leeches into the bag, eventually destroying it (don’t tell your kids that this will happen!). For fun variations, try different pieces of food in separate paper bags to see what happens. This is a great experiment for kids of all ages. Question: If you put food coloring into bubble solution, will the bubbles you blow be that color? Gather your bottles of bubble solution and all of your bubble-blowing tools. Start with adding a couple of drops of food coloring to the bottle or dish of bubble solution and blow some bubbles. Increase the amount of food coloring slowly, keeping track of how many drops you put in and if the bubbles are colored or not. This science experiment is easy, but it will take some diligence during the day. Question: How far will my shadow be lengthened by the sun during the day? Choose a spot on your driveway or patio and mark a large “X.” At the same time each hour, have your child stand on the “X” and trace his/her shadow with sidewalk chalk, writing the time down next to it. At the end of the day, take a look at your unusual artwork and talk about when your child’s shadow was the longest. This is a fun experiment for those unbearably hot days. There are two possible questions, depending on how many different kinds of water balloons you want to buy. Questions: Are water balloons of certain colors stronger than others? Which brand of water balloons is the strongest? For the first question, fill water balloons of different colors and choose something to throw them against, like the side of the house or the driveway. To make the experiment fair, the balloons need to be thrown the same way every time. For the second question, the test is basically the same except you’ll need to get a hold of three or more brands of water balloons! Avoid the blues with these easy and fun summer science experiments for kids of all ages! Kelly Wilson is an editor with Teaching Resource Center, a that provides quality educational materials at discount prices. It’s never been more important to engage a child's scientific curiosity, and Sean Connolly knows just how to do it—with lively, hands-on, seemingly "dangerous" experiments that pop, ooze, crash, and teach! Now, the author of The Book of Totally Irresponsible Science, takes it one step further: He leads kids through the history of science, and then creates amazing yet simple experiments that demonstrate key scientific principles. Tame fire just like a Neanderthal with the Fahrenheit 451 experiment. Round up all your friends and track the spread of "disease" using body glitter with an experiment inspired by Edward Jenner, the vaccination pioneer who's credited with saving more lives than any other person in history. Rediscover the wheel and axle with the ancient Sumerians, and perform an astounding experiment demonstrating the theory of angular momentum. Build a simple telescope—just like Galileo's—and find the four moons he discovered orbiting Jupiter (an act that helped land him in prison). Take a less potentially catastrophic approach to electricity than Ben Franklin did with the Lightning Mouth experiment. Re-create the Hadron Collider in a microwave with marshmallows, calculator, and a ruler—it won't jeopardize Earth with a simulated Big Bang, but will demonstrate the speed of light. And it's tasty! By letting kids stand on the shoulders of Aristotle, Newton, Einstein, the Wright brothers, Marie Curie, Darwin, Watson and Crick, and more, The Book of Potentially Catastrophic Science is an uncommonly engaging guide to science, and the great stories of the men and women behind the science. *We received a complimentary The Book of Potentially Catastrophic Science for review no financial compensation was received. WIN: Radius are giving away one Radius Toothbrush. WIN: Yes! 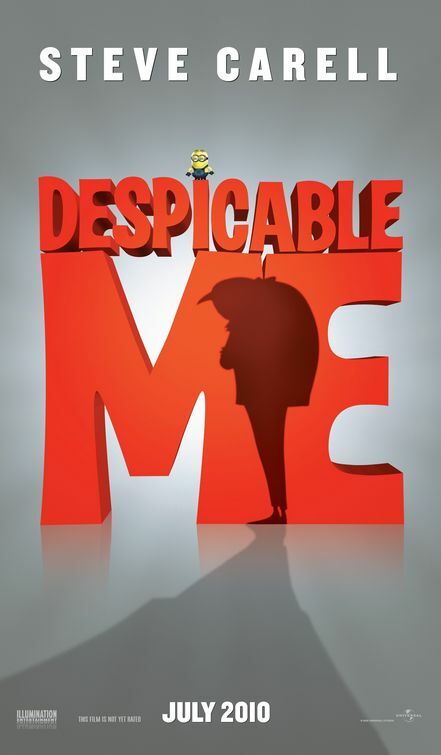 Today you can win movie tickets for the whole family to the special pre-screening event for DESPICABLE ME. The screening will be Tuesday, July 6th at 6:30pm at AMC Pacific Place Movie Theater in Seattle, WA. WIN: Free and money Saving coupons from Duncan Hines, Aunt Jemima, Mrs. Butterworth and French's Mustard. WIN: Franklin + Gower are giving away one pair of Franklin + Gower men's pants. 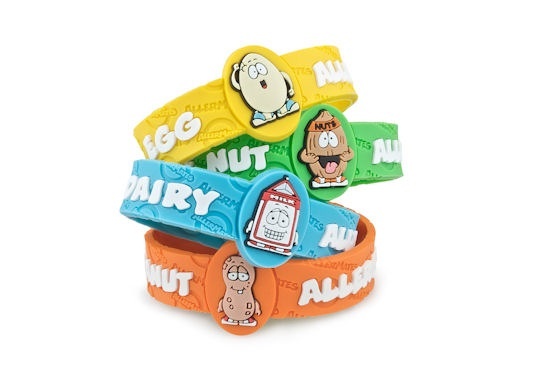 WIN: Allermates are giving away one of their amazing bracelet products.